It's a Night Train... but not quite as you know it. Promising to blend modern tones with a classic look, VOX's Night Train G2 NT15C1-CL is heading your way in August. 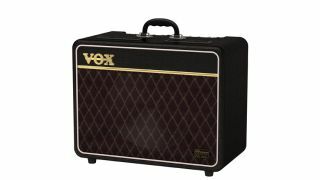 This combo amp does away with the metallic exterior that's previously been a hallmark of the Night Train series and reverts to the typical VOX look of diamond grille cloth and gold badge. Tonally, we're promised everything from clean to crunchy, plus hi-gain sounds and a whole lot more. The Night Train G2 NT15C1-CL has a UK RRP of £559. You can find out more on the VOX website. Robust all valve sound with class AB design; the pre-amp is driven by three 12AX7 valves, while the power amp contains two EL84 valves. Two-channel BRIGHT/GIRTH design that covers the spectrum from VOX's traditional clean/crunch sound all the way to a modern high-gain sound. You can use an optional foot switch to change channels. The THICK switch provides an additional gain boost on the BRIGHT CH. Excellent expandability, with send/return jacks for convenient connection of an external effect unit. High-quality reverb is a new addition on all Night Train models. The combo features a rounded retro look. Both are equipped with suitcase-type handles redolent of vintage taste.